Supported by Obertament and the Fundació Centre Mèdic Psicopedagògic d’Osona. In collaboration with ACVic Centre d’Arts Contemporànies and Universitat de Vic-Universitat Central de Catalunya. Deriva Mussol is part of the Nursery Projets of ACVic Centre d’Arts Contemporànies de Vic. This project is situated within the tradition of walking as an aesthetic practice. We produce our derives with the intention of translating, into the language of art, the continuing revelations which the experience in itself and the shared conversations provide. 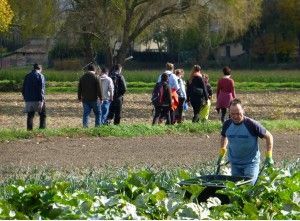 We propose to do a collective walk every Tuesday in the months of March, April and May during 2016, from 10 am until 12 pm, meeting at, and starting out from, ACVic Centre d’Arts Contemporànies (Sant Francesc, 1 Vic). Every participant is free to decide how often during this period to come along and share the walks, or the activities generated by them.